Laundry is a dreary household chore. Some homeowners install laundry rooms on the top floor, but if you don’t have that luxury, an inexpensive and simple solution to getting all your dirty clothes downstairs is adding a laundry chute. Before you do anything, check with the local building department to see if laundry chutes are allowed. Some cities do not allow them because they can provide an open path for fire and smoke to quickly spread from floor to floor. The hardest step in any laundry chute installation is the location. Unless you’re building a new home, determining the right spot for a laundry chute is not easy. You often need a direct path from the top floor to the ground floor or basement. So, the best place for a chute is usually non-ideal. 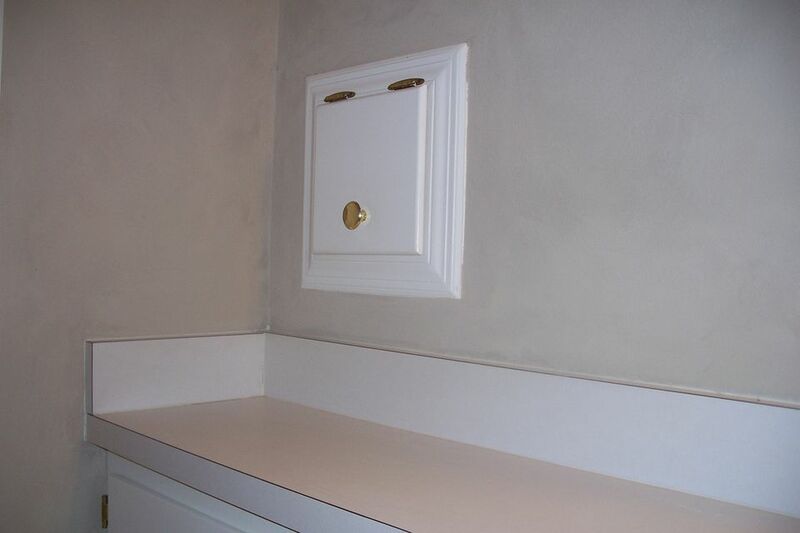 Your home builder should be able to tell you the ideal location for a laundry chute. If not, ask them for blueprints. Otherwise, find a good spot between two studs in the wall (usually 16” or 24” apart) and drill a small hole. You can use an inspection camera to see if there are any obstructions to the bottom floor. Determine the location of the laundry chute. Then, turn off the power to that area of your house. Locate the desired wall studs and mark them. Then, use a pry bar to remove the trim on the floor, between the two studs. Take your utility knife and cut the drywall above. The drywall hole should be 42” tall and run the length between the two studs. Cut the base plate with your reciprocating saw. The base plate is the piece of wood at the bottom of your hole, connected to the floor. These saws are dangerous. If you don’t feel comfortable using, call a drywall professional. If you are comfortable, continue to cut a hole in the floor so the chute has a path from one floor to the other. Attach two pieces of 2x4s to what will be the top and bottom of the chute. These pieces of wood will hold the laundry chute in place. Nail them to the studs. Assemble the laundry chute. If you purchased a laundry chute kit, now is the time to put it together. If not, you can build your own, but make sure you follow your building codes. If you have an issue fitting it into place, you can use metal-cutting snips to expand the opening. Screw the chute to your top and bottom 2x4s. Sheet metal screws are ideal but not necessary. If any edges are sharp within the chute, some homeowners duct tape over them to ensure no clothes rip as they travel through the laundry chute. Insert the end of the laundry chute into the hole in the floor underlayment. Replace the drywall. Expect to pay roughly $0.35/sf for drywall. Before you purchase, determine exactly how much drywall you need and save some cash in the process. Once the drywall is installed, prime and paint it. Install the laundry chute door by screwing it to the 2x4 support pieces. Don’t make laundry a more tedious task than it already is. In as little as four hours, you can eliminate trips up and down the stairs by installing a simple chute.